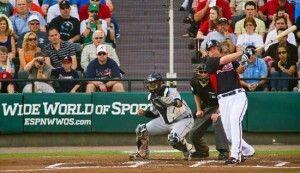 While spring may be a few months away, the Atlanta Braves are already gearing up to attend their spring training games at the Champion Stadium in the ESPN Wide World of Sports Complex. In total, the Braves will be playing 18 games at the Walt Disney World Resort, including three night games. The St Louis Cardinals (the World Series champs,) the New York Mets and the Philadelphia Phillies are just a few of the teams you’ll see playing against the Braves come March. In mid-February, the Atlanta Braves will report to Disney and will begin the spring training season on March 3. Tickets will be on sale starting January 7, 2012 at Ticketmaster outlets and the sports complex box office. For more information, including the complete training schedule, please visit espnwwos.com/atlantabraves. I hear it’s great fun to catch a game! Thanks so much for reading, Diana!